The Sierra Norte is ideal to learn riding a bicycle. The variety of reliefs, Plains at the bottom of the Valley and steep slopes on the slopes, It allows us to practice this sport, adapting it to our level. We also have many marked routes, tracks and country lanes to dive safely. Throughout the year the Sierra Norte It is a great destination for lovers of the bicycle, but perhaps the autumn is the station that offers temperatures and some chromatic contrasts that will make an unforgettable experience of our routes. Meridian Raid It offers us the possibility to rent a bike to travel roads that run along the Lozoya River. 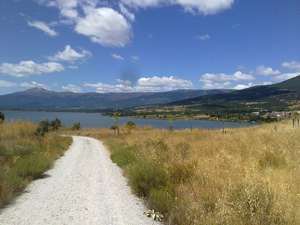 You can make different routes around the reservoir Pinilla and other sections of the Natural way of the Valle del Lozoya, suitable for both walking and bike tours with different difficulties. Meridian Raid offered us monitors and custom tours, developed on 5 routes sorted by difficulty. The easiest of all is that almost completely surrounds the reservoir Pinilla. You can exit from the municipalities of Pinilla del Valle or Lozoya and from there you can skirt the reservoir on both sides, but be careful! It is not a circular route and at some point you will have to turn. There are other two routes graded as easy in this area. A circular route from one 22 km coming from the Cuadrón, between woodlands and pine forests, upload to the Mondalindo skirt, falls to the Garganta de los Montes and, After crossing the municipality, comes back to the Cuadrón. The other, also circular of 21 km approx.. runs through the municipalities of Lozoya, Navarredonda, San Mamés and Gargantilla de Lozoya. Rural landscapes between pastures of oak and ash with high value forest. For the more expert, There are two more difficult routes, both circulars of some 22 and 30 km away each. The first got its start in Alameda del Valle, up to the Sheepfold of the lame, to reach the area of El Espartal and down to Pinilla del Valle and return to Alameda del Valle. A path with stunning views of the Valle del Lozoya. The second, It got its start in Rascafría, front of the information Office, starting toward El Paular and climbs along the path of purgatory to Morcuera. There take the deviation Canencia and arriving at the junction of the Sheepfold of the lame, down Alameda del Valle, returning it to Rascafría. The landscapes described along the Lozoya River are of a unique beauty, Nestled at the foot of the Sierra de Guadarrama always surrounded by the high altitude of the massif of Peñalara, the long rope, the high of the spring or Los montes Carpetanos. A valley with many places hidden among pine trees where you can find hermitages and bridges carrying us centuries ago. If you travel these roads don't visit the villages which are situated along the river and in this mountainous area and some of its assets of Cultural interest such as the monastery of Santa Maria de el Paular, in Rascafría and the Valley archaeological site of Neandertals, in the municipality of Pinilla del Valle. Wait no longer and come and join in! 5 biking by the Valle del Lozoya ! 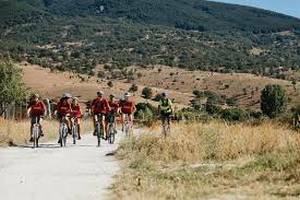 For the more adventurous, we remind you that the Meridian Center Lozoya Raid is located next to the cycling tour Ciclamadrid MTB Tour, that with their 210 km runs throughout the Sierra Norte de Madrid. And for those who still have forces after any of these routes, Remember that Meridian Raid organizes activities adventure and sporting events, with 3 centers in the Sierra Norte de Madrid: Lozoya (reservoir Pinilla), El Berrueco and Cervera de Buitrago (El Atazar reservoir). With such diverse activities as: rope Adventure Park, playground balls, trampoline, Bouncy Castle, pedal karts, mountain bikes, climbing indoor and outdoor climbing wall, Snowshoes, hiking, orientation, workshops for children, archery, zip lines, canoes, paddle surf and sup and the candle king.